Andy H: Thor has been a constant on my pull-list for well over ten years now, since way back when J. Michael Straczynski took over the writing. Since then it's gone from strength to strength with Jason Aaron lately making every issue an unmissable event. 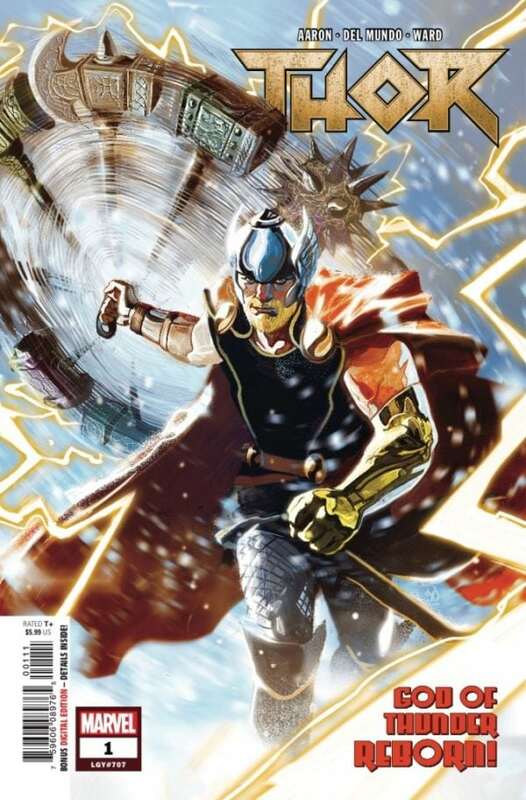 Now he's back with Thor #1 and is joined by artist Mike Del Mundo. The Odinson has been restored as the God of Thunder and must find Asgardian artefacts scattered across the Earth. I have to say, it's a shame Marvel have decided to make this a $5.99 book as this could put off many potential new readers to what should be a great read. Venom #2 makes this week's pull after the cracking first issue won me over with some interesting new twists on a character you think you know. Donny Cates once again proves why he is a real hot property for Marvel at the moment. Giant Days has been one of my favourite titles over the last few years thanks to the writing of John Allison. Now he brings us By Night #1, which moves away from the down-to-earth Giant Days to something a little more fantastic, as friends Jane and Heather open a portal to another world. I have high hopes for this one. Marvel 2-In-One Annual #1 pairs regular series writer Chip Zdarsky with artist Declan Shalvey and, if that isn't enough, we've got Doctor Doom and the Council of Reeds! That should be enough to tide over Fantastic Four fans until August. Jo S: I appear to have reached the stage in my comics addition where I shall be selling the TV and pinching cash from my mum’s wallet to pay for my habit. This week’s first pass of the list was a monumental 26, and hacking away anything that didn’t shout for its spot only managed to get it down to 17, still way beyond what I can quietly carry into the house and stash before my husband notices. There is so much good new stuff this week - more bounty than my tiny brain can handle - so I will just pick a few of the highlights here. Marvel treats abound: my Rosenberg fix appears in the form of New Mutants: Dead Souls, the interestingly styled Quicksilver: No Surrender makes issue #2 - the art in the first issue was clever and distinctive and I hope the series continues in its novel streak - and a beautiful bumper issue of Thor spins up the new series, with Thor Odinson back in the lead. Aaron and Del Mundo should make an exhilarating team in the main book but I’m especially keen to see the backup story - Christian Ward’s art really captures my imagination and I can’t wait to see how he handles King Thor and the far future of the Thor story. Image also excel themselves this week: as well as the very twisty The Dead Hand and the gripping Oblivion Song, I’m a sucker this week for two new Image titles: The Weatherman boasts Shirtless Bear-Fighter writer Jody LeHeup and Dave Stewart colours - tick, tick - plus it looks like it might entice the giggles out of me, and the Mark Millar-Olivier Coipel combo on The Magic Order makes this an unmissable new tale. Quality rather than quantity is the defining requirement for the top spot on my list though, and nothing else comes close currently to the unfiltered magic of Mister Miracle. Seeing that this issue puts us three quarters of the way through this flawless series gives me a little pang of anxiety: King and Gerads have consistently raised the bar with every issue and, if you’re not reading it yet, *puts on sternest bossy voice* you should remedy that immediately.